Has mealtime turned into a stressful experience since you were diagnosed with mesothelioma? Are you worried about maintaining your weight because your appetite is missing? Does food sound unappealing thanks to the side effects of chemotherapy and radiation therapy? Don’t panic: this is normal. At some point after their diagnosis, nearly half of all cancer patients develop cachexia. This condition involves involuntary weight loss and muscle atrophy, even when patients are not trying to lose weight. Anorexia can also arise in cancer patients. This condition which should not be confused with the eating disorder anorexia nervosa refers to general appetite loss because of food aversions. Often patients develop cancer-related anorexia after the side effects of cancer treatment kick in, such as nausea, vomiting and diarrhea. Understandably, these conditions can make mealtime stressful for mesothelioma patients. Because this unnecessary stress can add even further to appetite issues, patients should do whatever they can to make mealtime a pleasant, easy experience. Be flexible with your eating schedule. Some patients find that eating small meals every two or three hours helps them manage their hunger levels. Other patients find that they are not hungry enough to eat that frequently. Appetite can also change from day to day. Take the time to learn your hunger cues, and eat whenever your appetite is high. If your appetite is completely gone, be patient with yourself but do what you can to make sure you are still taking in adequate calories. Eat what appeals to you . . . within reason. While it’s important to eat nutrient-dense foods, it’s equally important to provide yourself with enough calories to sustain recovery. Don’t beat yourself up if the thought of a “healthy” choice like a salad makes your stomach turn. Instead, pick something that does sound good so that you can get some food in your body. Good choices for these occasions include mashed potatoes with gravy, pasta with butter, chicken noodle soup or other comfort foods. Giving yourself permission to eat the foods you want to eat can be helpful when your appetite is unsteady, but there are still some foods you should avoid, even if they sound good. Spicy foods, greasy or fried foods can all do damage to your stomach that you may regret later. Try to avoid these at all costs. With mesothelioma, you may have days where you have plenty of energy followed by days where you are extremely fatigued. 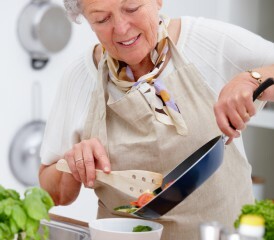 To help shorten your cooking time on days you are exhausted, try making double batches of food whenever you cook. Eat one serving that day, then place the rest in the freezer. If you have these frozen meals on hand, you can avoid the stress of cooking when you feel ill.
Don’t underestimate the power of an appealing presentation! Interestingly enough, patients often feel more enticed to eat their meals when they are well-presented. Plate your meals on colorful dishes and use colorful fresh fruits and vegetables as a garnish. To go a step further, use special placemats or music at mealtime for a more enjoyable experience. Do you have any fitness or nutrition questions you would like me to discuss? Let me know in the comments below or on Facebook.